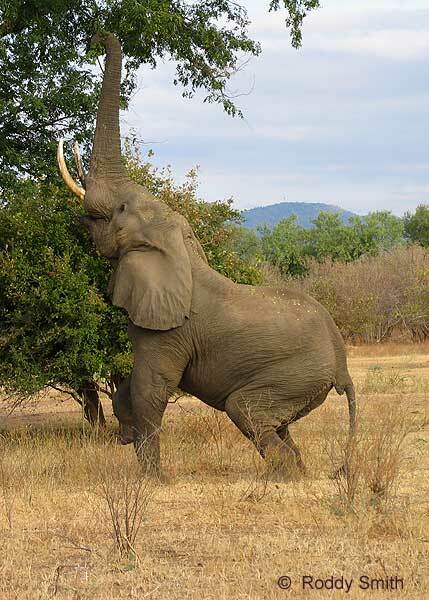 Caption: Elephant reaches up with trunk to pluck fruit from tree, Lower Zambezi National Park, Zambia. © Roddy Smith. Equipment: Picture taken with a Canon PowerShot Pro 1 digital camera. Location: The Lower Zambezi National Park in Zambia covers an area of 4,090 sq km. It is situated on the northern bank of the Zambezi River and enjoys about 120km of spectacular river frontage. The park offers an exceptional safari experience for visitors, with options of canoeing, tiger fishing, game drives, and sundowner cruises available. There is no camping available, but accommodation is provided by a number of upmarket safari lodges.